Tatiana Morand is the Content & SEO Manager at Wild Apricot, the a membership management software for small nonprofits, associations, and clubs. When she’s not creating content to support nonprofit success, she’s checking out new cafes and brunch spots in her hometown of Toronto. Cassandra, 26, describes some of the barriers us millennials face when it comes to charitable giving. And even the word ‘millennial’ may evoke an image of a self-absorbed, tech-obsessed youngster (even though the youngest of us are now in our 20s) who can’t afford a house because we buy so much avocado toast. Yet contrary to this generalization, many of us do really want to help make the world a better place — a statement backed up by recent studies showing millennials are even more cause-motivated than previous generations. In fact, whether we’re carefully choosing our next pair of jeans based on corporate social responsibility or sharing petitions on our Facebook pages, millennials believe we have a role to play in demanding and promoting good in the world. However, I will acknowledge while we might be engaged on social media, it can feel difficult to get us to put their money where our mouths are. That’s because, like Cassandra, many of us are racked with student debt and struggling to navigate record high rent prices… all while making entry level salaries. Plus, given the proliferation of cause campaigns on social media, choosing just one to support can also feel intimidating and exhausting in a way other generations haven’t had to deal with. However, there’s good news: millennials still want to give, and we still do. 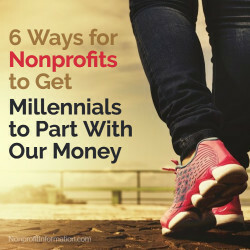 The 2016 Millennial Impact Report found that more than 50% of millennials donate to charitable organizations — and the 2017 report found that 35% of them have increased their donations since the 2017 election. So, here are 6 ways to get millennials running for their checkbooks…I mean, credit card numbers…I mean, Venmo! Millennials are much more likely to engage in causes with online platforms. We check our phones an average of 75 times a day for work and leisure… so make it easy to access your campaign from them. Why do we like donation websites so much? Clicking on a link and typing in our credit card number, or providing a money transfer app like Paypal, Venmo, or Cash, is 10x faster than digging in the junk drawer for our cheque books. Plus, we’re busy — and we know you are too. In the long run, this kind of efficiency can help both of us! “It wasn’t until my friend posted a video on his Facebook page for a fundraising challenge and shared his own experience with childhood cancer at the hospital that I finally gave. It really moved me, and I didn’t even think twice about donating,” said Cassandra. Millennials in particular have grown up with unprecedented access to the stories and realities of people all over the world. Some of the most successful online campaigns are those posted on crowdfunding sites like GoFundMe, Indiegogo or YouCaring. These platforms allow individuals to share an intimate window into a very specific need or cause on their own terms and in their own voices. The rise of this type of storytelling means that all organizations need to make their campaigns rooted in the lived realities of those they’re supporting, and share those stories in new and interesting ways. Wondering how this is done? Look through your recipient list or supply closet and demonstrate the reality of a real individual or real situation your nonprofit organization is facing, and tell that story and raise money for that cause. We might not be ready for a recurring gift, but they do tend to respond to a real, meaningful crisis. C’mon, we all feel good after giving. Who doesn’t want to tell other people about it? So, be sure to include an option for your donors to share how they’ve supported your organization on Facebook, Twitter, and Instagram. And best of all: sharing doesn’t just boost your donor’s social standing, so you might even attract more new donors. It’s a win-win! While millennials do like to donate, that’s not the only way we like to engage with the causes that matter to us. Recent research shows that 46% of us engage in some sort of volunteering — which can also be an opportunity for cash-poor millennials to feel like we’re still making a difference. Creating volunteer opportunities for us not only helps you get some important projects completed, but deepens a donor’s sense of connection to your organization and to other donors — or helps us see exactly how our dollars would be used were we to donate, and makes us more likely to contribute. The days of sending off a check and forgetting about it until the annual holiday postcard from your favorite charity are over. Just like millennials have come to expect efficiency, we’ve also come to expect accountability. With various websites like Charity Watch, where you can check the ratings and ethical history of thousands of charitable organizations, transparency matters. We’re sick of hearing about scandals — we just want to help you make a difference. So, to keep us engaged, make sure you explicitly tell millennial donors where our money is going, and share tangible results at several points during the year. We’re not expecting miracles, but we do want to know if our funds are helping you do good. According to the the 2017 Millennial Impact report, 51% of American millennials believed the country was off track at the end of the year. So, we want to know: what is your organization doing to change that? We’re more interested in political issues than ever before, and are more likely to put our money where our views are. So, hearing where your organization falls on the political spectrum and knowing that you’re engaging in advocacy for issues we care about makes us more likely to support you. Despite all the negative generalizations you may have heard about selfish millennials, I can assure you they’re not true — or at least, not any more true than they are for any other generation. So, although we might face barriers to donating past generations haven’t seen, that doesn’t mean we’re unwilling to do it. If you can make it easy for us, give us options, and stay transparent with us, you’re sure to rack up millennial donations in no time!